It is not often I have the pleasure of reviewing non-fiction books for children so I am delighted to share my thoughts on this new one coming out this month. It is a total exploration of all the wonderful patterns we see in nature. Often when we see an insect, animal, plant or indeed any natural thing, we may immediately see the beauty in them but we may not always see the patterns. We don’t necessarily understand the purpose of those patterns either but this book delves in to the reasons and explains it all in very easy terms. The book is a stunning montage of bright natural colours with photos from tiny swan plant seed bugs to helix spirals on snails. Nature is brimming with shapes and patterns that all have purpose. Camouflage has always been one aspect that amazes me. For example, the stripy patterns on tigers help them blend into the long grasses. Each page focuses on a particular pattern from spirals, symmetry, and spheres to crystals, fractals and so many more. Information is in bite-size bits to easily digest and tempt readers into looking closely at the patterns. The whole layout is just perfect to dip in to over and over again. 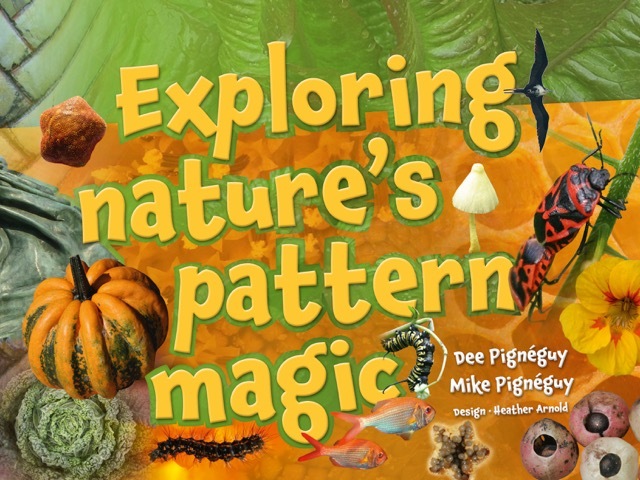 There are four pages dedicated to activities that readers can do to learn more about patterns in nature and this is followed by a very good index page. This is a wonderful book, perfectly packaged and ideal for any home or school library.